Rachel Maddow Tops Ratings For Second Month - Joe.My.God. 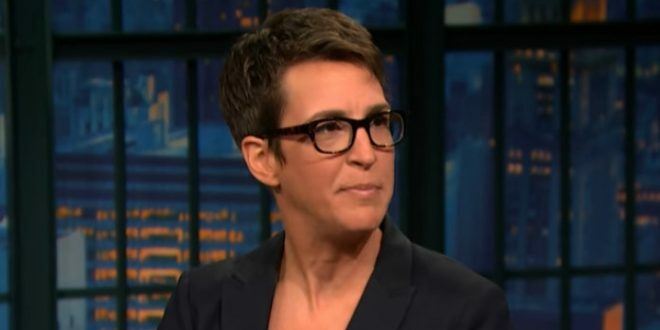 MSNBC host Rachel Maddow had the most-watched show in cable news in August, ending the month with 2.783 million total viewers, according to data released by Nielsen Media Research. It was Maddow’s second month in a row as No. 1. Maddow narrowly beat Fox News Channel’s Sean Hannity, who had 2.679 million total viewers. The remaining shows in the top five for the month were Fox News’ Tucker Carlson (2.483 million), MSNBC’s Lawrence O’Donnell (2.352 million) and Fox News’ The Five (2.351 million). Maddow was also first among adults 25-54, the critical demographic to advertisers. MSNBC’s prime time viewership is up 63% over last year and CNN is up 41%. Both slightly trail Fox News.